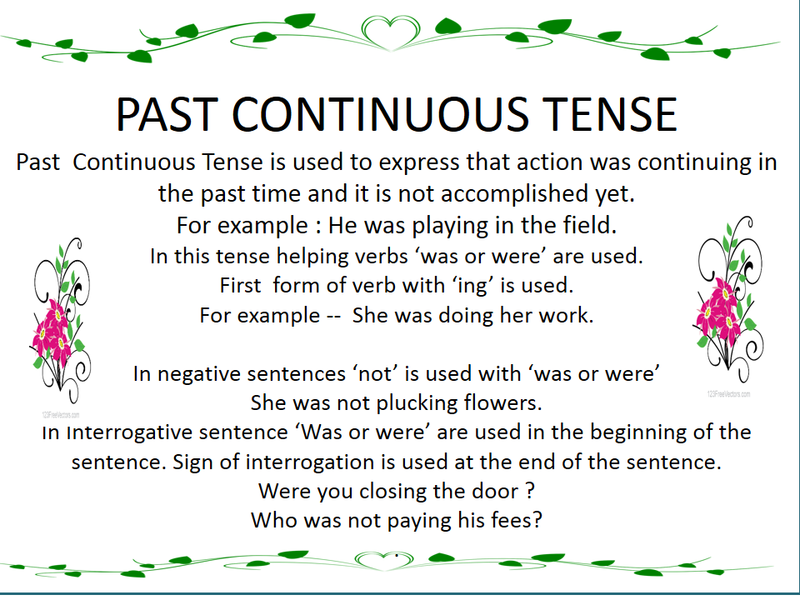 Past Continuous Tense shows that an action was undertaken in the past time and it still continued. It was not complete. There is no mention of time of completion of the action. This tense is also known as Imperfect Tense or Progressive Tense. For example: She was reading a book. Children were not plucking flowers. Why were they not doing their work? In this Tense work is being done in the past and was continuing. 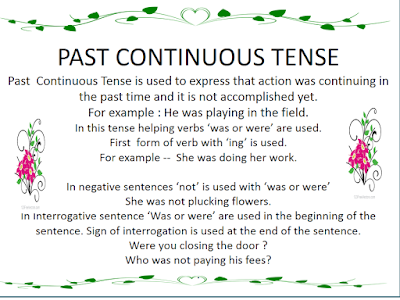 For this tense was & were and first form of verb with ‘ing’ is used. With first person singular and third person singular 'was' with 'first form of verb' and 'ing' is used. 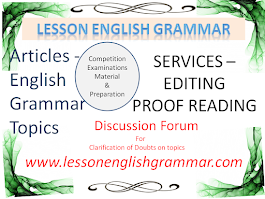 With first person plural, second person singular and plural and third person plural ‘were’ with 'first form of verb' and 'ing' is used. 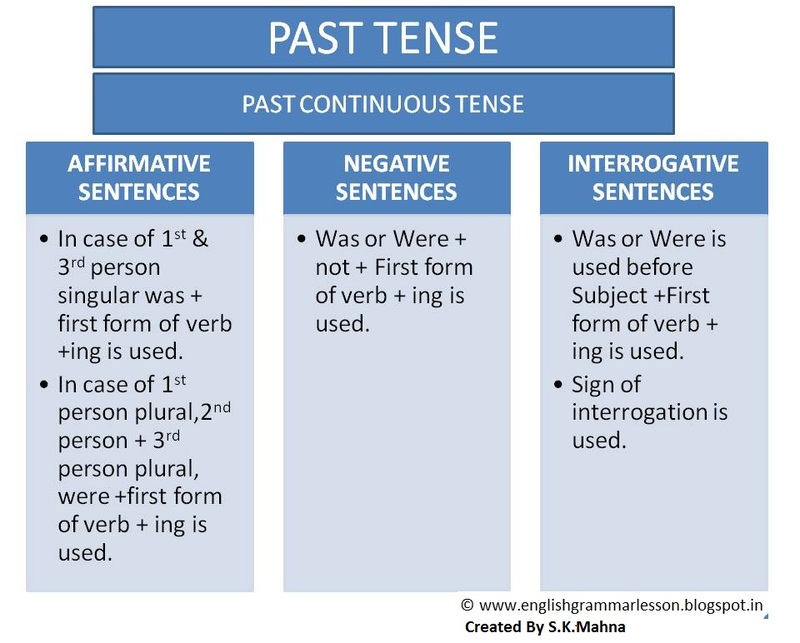 In negative sentences 'not' is used after 'was or 'were' and before verb. In interrogative sentences 'was' or 'were' is used before subject. 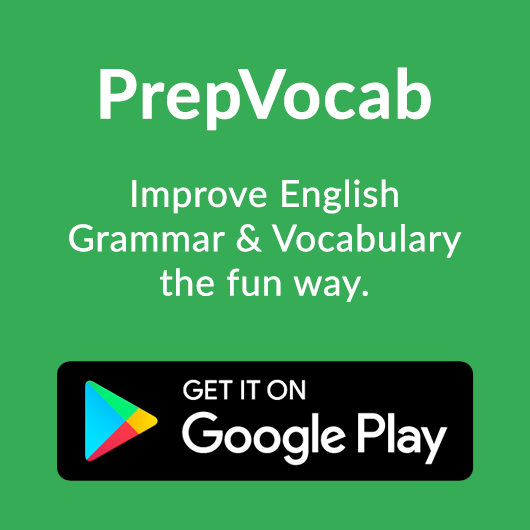 First form of verb with 'ing' is used. Interrogative sign is used at the end of the sentence.. Were the boys playing a match? In case of interrogative sentences starting with 'wh' the word with 'wh' is used in the beginning of the sentence. Here are some interrogative sentences starting with 'wh'. 1.Why was the child weeping ? 2. Whom were you finding out? 3. Where were you residing during this time? 4. Which boy was not participating in the contest? 5. Who was driving the car? 6. Whose child was weeping at that time? 7. When are you leaving for your office? 8. Where are the children going? 9. How was he feeling yesterday? 10. How many person were sitting in the room? Fill in the blanks using appropriate form of given verb in Past Continuous Tense. 1. Boys ....... ...... (throw) stones in the pond. 2. It ...... .........(rain) yesterday. 3. The gardener ....... ...... (plant) plants. 4. We ......... .......... (walk) in the park. 5. You ...... ......... (obey) your father's orders. 1. These boys ....... not ....... (do) their homework yesterday. 2. Children ........ not ...... (eat) oranges. 3. Stars ....... not ....... (twinkle) in the sky. 4. He ...... not ...... (attend) the office yesterday. 5. I ...... not ....... (bathe) in the pond. 1. ....... she ......... (carry) a pitcher on her head? 2. .......... the children ........ (quarrel) among themselves? 3. ........ the boy ........ (hide) himself behind the tree ? 4. .......... the child ........ (sleep) in the cot? 5. .......... the father ........(read) a newspaper? 1. What ........ you ......(do) there? 2. How ....... the patient ........(feel) now? 3. When ....... she .......(plan) to start? 4. Where ....... the clothes ........ (lie) ? 5. What ....... the girls ....... (carry) on their heads? She ...... ...........(sit) in a chair near the window. She .... ........ (look) constantly outside the window. Perhaps she .... ..........(wait) for some one to come. Far away the sun ...... ........(set) in the west. The shadows of trees ....... ......... (fall) on the ground. Some farmers ...... ........( go) along with herds of animals towards their homes. Some women ....... ........(carry) logs of wood on their heads and ...... .........(head) towards their homes. A pall of dust ..... ........ (fly) in the air. The dust in the air ......... ......... (make) the scene a little dim and unclear. All of sudden she saw that a motorcycle ........ ......... (come) from far towards her. She ...... .......(feel) very happy to see this. She got up from the chair and went towards the door. Standing there she saw that her brother ... .....(come) on a motorcycle. Her brother ....... ....... (return) home after a long time. Fill in the blanks using appropriate form of given verb in Past Continuous Tense..
1. Boys were throwing stones in the pond. 2. It was raining yesterday. 3. The gardener was planting plants. 4. We were walking in the park. 5. You were obeying your father's orders. 1. These boys were not doing their homework yesterday. 2. Children were not eating oranges. 3. Stars were not twinkling in the sky. 4. He was not attending the office yesterday. 5. I was not bathing in the pond. 1. Was she carrying a pitcher on her head? 2. Were the children quarrelling among themselves? 3. Was the boy hiding himself behind the tree ? 4. Was the child sleeping in the cot? 5. Was the father reading a newspaper? 1. What were you doing there? 2. How was the patient feeling now? 3. When was she planning to start? 4. Where were the clothes lying) ? 5. What were the girls carrying on their heads? She was sitting in a chair near the window. She was looking constantly outside the window. Perhaps she was waiting for some one to come. Far away the sun was setting in the west. The shadows of trees were falling on the ground. Some farmers were going along with herds of animals towards their homes. Some women were carrying logs of wood on their heads and were heading towards their homes. A pall of dust was flying in the air. The dust in the air was making the scene a little dim and unclear. All of a sudden she saw that a motorcycle was coming from far towards her. She was feeling very happy to see this. She got up from the chair and went towards the door. Standing there she saw that her brother was coming on a motorcycle. Her brother was returning home after a long time.